Cost of child care in America: still outrageous, yet somehow more so. A family earning the median household income spends 18 percent of it on child care. One of the stranger policy twists in this very strange election season is that the high cost of child care has become a favorite talking point for both the Democratic and Republican nominees for president. Hillary Clinton proposes capping child care expenses at 10 percent of a family’s income. And Donald Trump has said he would allow parents to deduct the cost of child care from their income taxes—thereby excluding the low-income families who most need help, but never mind. Forty-five years after President Nixon vetoed a universal child care plan because of its “family-weakening implications,” today both major-party nominees see child care costs as a problem that benefits them to address. Today, a new joint report from the think tank New America and Care.com illustrates why. In short, the cost of child care in America is outrageous. The average cost of enrolling a child age 4 or younger full-time at a child care center in America is $9,589 a year, which is higher than the average cost of in-state college tuition. A family earning the median household income would spend 18 percent of it on child care. For a single parent earning minimum wage, child care would eat up 64 percent of her income. And that’s for one child. For perspective, child care is considered affordable if it doesn’t exceed 10 percent of a family’s income, according to standards from the Department of Health and Human Services. Not only are current costs way beyond that for many parents, but they have risen at nearly twice the rate of inflation since the end of the recession. Of course, the U.S. remains the only industrialized country that does not require employers to provide even a single day of paid parental leave, and the Family and Medical Leave Act mandates just 12 weeks of unpaid leave for mothers after childbirth. That means many working parents need to place their children in some kind of care setting within weeks. And the costs for infant care are 12 percent higher than they are for older children, according to the new report. Meanwhile, only 11 percent of child-care centers and home-based care settings are accredited, a measure of both basic safety and educational quality in what is increasingly understood to be a crucial developmental period. The report addresses quality and availability of care along with cost. All vary widely in what the report describes as the country’s “fragmented, patchwork system.” With expenses so high and availability so spotty, many families decide to rely instead on the “gray market” of unregulated options: care provided by family, friends, or neighbors, which is often unreliable and even unsafe. In other cases, women (yes, usually women) cut back on their hours or simply opt to stay home with their children, making the reasonable calculation that it makes little financial sense to work if your income is effectively being funneled into the child care that you need because you’re going to work. Meanwhile, child care workers themselves are often paid poverty wages. 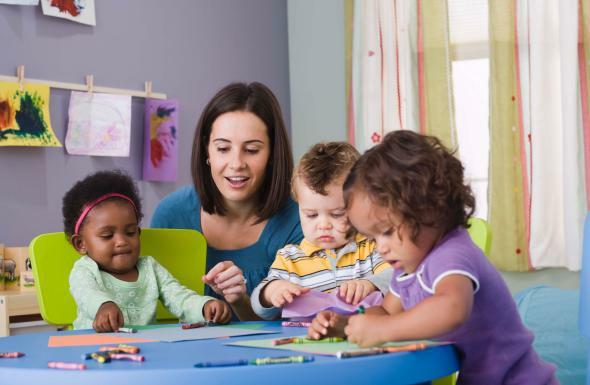 Nationally, their median wages are less than half of the average for kindergarten teachers, according to a report released in July by the Center for the Study of Child Care Employment. In 2015, almost half of early childhood workers in the U.S. relied on public assistance. When it comes to child care in America, parents, children, and providers are somehow all getting the short end of the stick. The “family-weakening implications” of our current broken system deserve attention during this presidential election—and afterward.